Bonita Vista players have fun in Las Vegas during their trip. 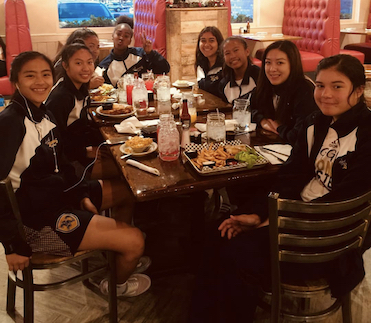 LAS VEGAS (12-15-2018) – It would be an understatement to say that the Bonita Vista Lady Barons are being battle-tested week in and week out, in a quest to tuneup the girls, to prepare for the second season, or league play. The teams they face in league play are not to be taken lightly. Saturday evening’s contest, as with all of their games, would be another teachable moment as they faced 2-0 Centennial, a powerhouse in the Las Vegas area, and ranked No. 9 in the nation. The first quarter of action saw the visitors able to compete early, closing out the first eight minutes, only down 16-13. The wheels began to fall off in the second quarter, however, as the Barons were down 41-16 at the half. Bonita Vista must have had a typical, inspirational speech from Coach Lamb to get their heads together and remain focused on the task at hand. Whatever it was, the Barons were a tale of two halves. With such a huge deficit to overcome, the Lady Barons would have their work cut out for them, but these ladies never give up as they began to play defense and become more of a scoring machine. Down 41-16, the Barons would add 16 in the third quarter, led by Cosalan with six points and teammate KEYANNA MCCOY, playing great defense with a few key steals, rebounds, and backing up Cosalan in the points department. Another added thorn in the side of the Barons, trying to climb back into this contest, key player on all fronts, ANNETH GRIJALBA, going down in the third quarter, hopefully, a short-term injury as she will be needed to compete. She is a competitor that has a heart of a warrior and will make it back to the line up quickly. The Barons never gave up as they continued to play 100 percent in the fourth, but coming up short in the loss, 70-42, to a phenomenal Centennial team.